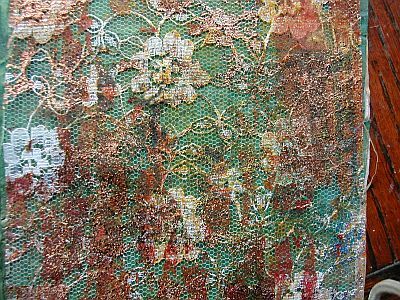 This lace has got painted Bondaweb fused to it, and foil added to reveal the texture of the lace. Here are a couple of the photos of painted Bondaweb before I adhered them to the various objects. 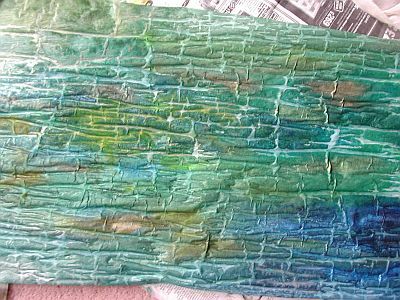 It goes into an interesting texture when it is wet and dries like that. 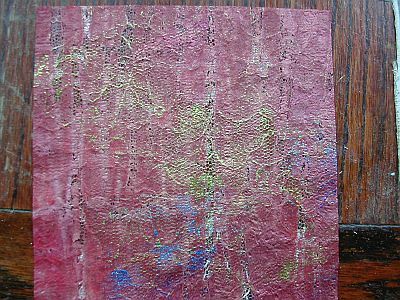 I used Jacquard textile paints mainly. Some Lumiere too. I can see some lovely development coming from this work Liz. I have loads of painted bondaweb, but mostly in dark colours, why I don’t know. Just happened I think. That Lumiere works well, so I must try it soon. Really like the brick like effect you’ve got in the two bottom pieces. I’ve got some lumiere so must try this. I love the last two! 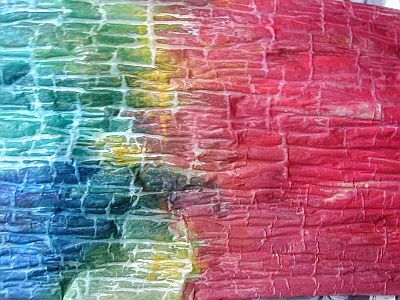 The texture is fabulous! Previous PostPrevious Brown paper and Bondaweb! Next PostNext More sticking and painting!